Weatherbury Farm offered farm vacation stays for 25 years, from 1992 until 2017. Thousands of folks visited the farm to learn more about farming and agriculture and the opportunity to kick back and enjoy life in the slow lane. We met a lot of wonderful folk and thank everyone who visited! In 1980-81, Dale was on a liaison assignment with Bayer AG in Leverkusen, Germany. Due to the nature of the assignment, he was eligible for six weeks of vacation (standard for German workers). Dale and Marcy soon discovered pensiones and guest houses — and loved the experience! We enjoyed the opportunity so much that we decided a bed and breakfast would be in our future. On returning to the United States, we continued to vacation in bed and breakfasts. And began looking for an old house to restore, on about 10 acres. After two years, and many homes, we fell in love with what was to become Weatherbury Farm (with its 100+ acres). The rest as they say is history. 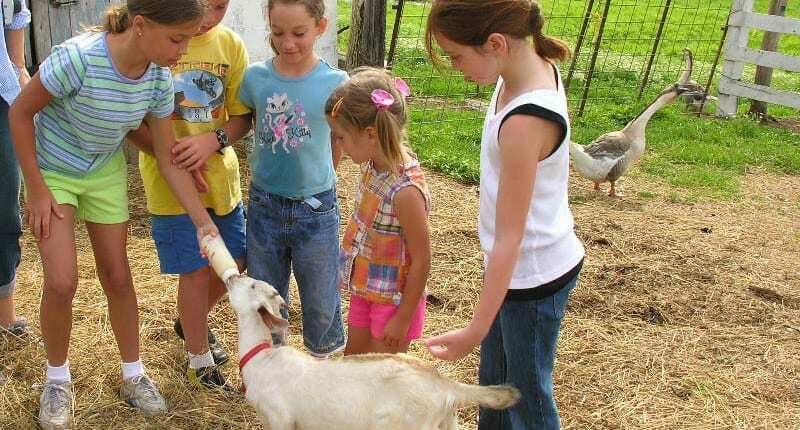 The Weatherbury Farm Kids Program began in 1998 to give the young and young at heart the opportunity to learn more about farming and agriculture. 1420 kids completed the “Junior Farm Kid,” ”Farm Kid,” and “Junior Farmer” program over the years. Farm Stay Visitors received a packet (filled with coloring & activity books and educational materials) about farming and every child was invited to earn the “Official Weatherbury Farm Kid” designation. After enjoying Weatherbury’s farm breakfast, children of all ages were invited to help with in-depth morning chores. Chores included many different farm activities (depending on the time of year and interest): pumping water at the old hand pump for the animals, bottle feeding baby animals, feeding baby chicks & ducks, feeding and watering chickens at the hen house and gathering eggs (the high point of many children’s visit), visiting the flour mill (after it opened in 2014, visiting the garden (and perhaps digging onions or potatoes or collecting other vegetables), and visiting the cows in the field. Chore time also included an explanation of the farm equipment and was an opportunity for both children and parents to ask Farmer Dale questions. The emphasis during farm experience chores was naturally on the organic and sustainable production methods used at Weatherbury Farm. There were many activities right on the farm for the guest who wanted to be busy, and those who so desired could be busy doing nothing at all. Guests could relax on the porches, picnic on the grounds, or enjoy the swimming pool on a summer day (pool was open memorial day to labor day). Many families had fun watching (from a distance, of course) Farmer Dale & Farmer Nigel at work in the fields. Or sometimes (more often than we liked), the farmers might have been working on keeping the farm equipment in good running order. Some families liked to get their hands dirty and help Marcy in the garden. With Pittsburgh, Washington PA and panhandle West Virginia are within easy driving distance, Weatherbury Farm provided a stopping-off place for exploring the many attractions of the area. Thus, some families chose to visit nearby attractions during their stay. Our booklet, “Everything you wanted to know about Weatherbury Farm and What to do during your stay” gave information not only on the history of the farm, our operations and animals but also about the wealth of attractions that could be visited in the area. Most families, however, enjoyed the opportunity to kick back and relax on the farm and enjoy life in the slow lane. One mother and daughter visited the farm for a week and left only to replenish their food supplies. 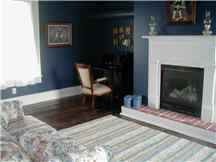 (Each room had a small fridge and there was a grill and microwave for guests’ use). Weatherbury Farm is the setting of Thomas Hardy’s novel Far From the Madding Crowd. We chose the name to emphasize that the farm, while only 45 minutes from the hustle and bustle of Pittsburgh, is a place apart, where life passes at a different pace, slower, somehow richer.